This inspirational and sometimes uncomfortable read challenges many core beliefs about childhood. The author has a conversational style, drawing on his considerable experience as a clinician and commissioner for children. He takes the reader with him on a journey of illumination and discovery. 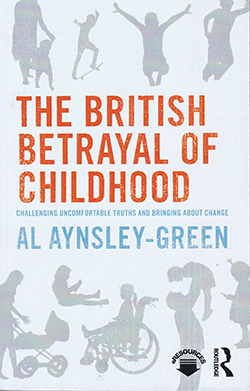 At the heart of the book is a description of the correlation between adverse experiences in childhood, the failure of policy makers to make special provision for children and the potential failure to achieve a healthy adult population. The author is especially disappointed that the 2004-2014 National Service Framework, which was initially mandatory, became merely aspirationa, thereby hindering any impetus to enshrine it in practice. The statistics are disquieting: one in ten children have a mental health disorder, one in six live in poverty, one in seven have witnessed or experienced domestic violence, and one in five leave school without the fundamental skills to read and write. The author calls the lack of attention to the emotional and mental health of children and young people a ‘national disgrace’, adding that policymakers have been ‘disinterested, indifferent and complacent’. He offers examples of how other countries value their children, and ends with a call to action to incorporate some of these principles into policies to support children and their families in the UK. Although not intended specifically for a nursing readership, I would urge children’s nurses to peruse this book and take to heart its messages.